You can add images via "Images" content block from a PC, via URL or from My Library. Images are a wonderful way to brighten the course. When you create a new content page, choose Images layout on the left. With the Image content blocks, the only thing you need to do is to replace a default picture with the one you want. Left click a default image and press the Change image button. 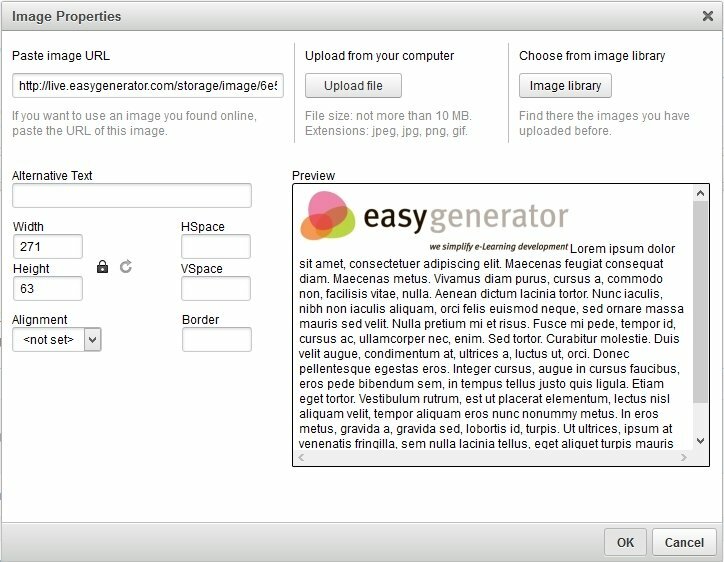 You can upload an image from your computer, choose one from the Library or embed a link to the image. Also, you can change the alignment, zoom and resize the images. After clicking on the Image button, you will see a pop-up window with image properties. Paste a URL to add any picture from the Internet. Add a picture from the image library. All images that have been uploaded from your computer are stored in My library. You can re-use those pictures as many times as you need. Add an alternative text to an image (in case an image isn't displayed, this text will be shown to a learner). You can learn more about preferred image sizes here.